Ferries are the most important communication links between the Canary Islands and although there are direct flights from the UK to the airport of Santa Cruz de La Palma they are all (to the best of my knowledge) for those on package holidays and not suitable for the independent traveller. There are inter-island flights but they are expensive if you are not a Canary resident – who get subsidised travel. Here is some practical information for those wishing to travel from Los Cristianos in the south of Tenerife and Santa Cruz on the island of La Palma. Tenerife Sur is the busiest airport in The Canaries and as both Ryanair and Easyjet fly there opportunities exist for cheap flights. To get from the airport to the centre of Los Cristianos you don’t need to get a taxi as there are two buses that serve the route. The 111 and 343 both stop at the airport. The cost one way is €3.10 and takes about 20 minutes. It’s about a 10 minutes walk from the bus station in the centre of Los Cristianos to the port. Two companies offer an option on this route. Naviera Armas run the slower boat whilst the Fred Olsen Express run the jet propelled fast ferry. This used to have a reputation as a whale killer – the lack of a propeller mean they have a low sonar signature. The normal boats that cover this route are the Volcán de Teide (Armas) and the Benchijigua Express (Olsen) and have a passenger capacity of 1,500 and 1,291 and top speeds of 26 and 38 knots respectively. With such foot passenger capacity you would have to be extremely unlucky to not get the boat on the day you might wish to travel. However, although turning up and getting on board might not be a problem it’s well worth while booking in advance (both have that facility on their web sites) as the prices are cheaper if you book some days before departure. In the low season you can expect to pay up to €35 for Armas and €43 for Olsen. In both directions the two lines call in to San Sebastian de La Gomera. The scheduled time for the ‘slow’ boat 3 hours 45 minutes and the fast one is 2 hours 50 minutes. When I took the slow boat from Los Cristianos in January 2014 it left 15 minutes late and somehow lost another 30 minutes in what seemed, at least to me, favourable sea conditions. The difference of an hour shouldn’t make much difference unless you might be catching a flight from either of the Tenerife airports. What might well be worth considering, though, is any desire you might have to spend time out of the interior of the boats. The Volcán de Teide has bar facilities, which are open in the summer, on the top deck which is a great place to soak up a bit more of the Canary sun and take a look at La Gomera as you pass along its eastern side. The only place you can stand outside on the Olsen boat is at the stern as the speed of the boat will have you swimming the rest of the journey if you get caught in the wind. When I first went on the Olsen boat some 12 years ago another down side was the noise but these vessels and becoming more powerful and quieter all the time. Maybe not good news for whales but perhaps for the passengers. As for facilities on board they’re much of a muchness. The normal bars, cafés, restaurants (not on the Olsen) and shops as well as some sort of place for young children to play. But if the weather is good it makes sense to just watch the world go by, soaking up the sun with a cold drink in hand. As for departure times the Volcán de Teide leaves Los Cristianos at 18.30 Monday- Friday and 12.00 on Sunday. There’s no sailing on Saturdays. From Santa Cruz de La Palma it’s a crack of dawn touch as it leaves at 04.00 Tuesday-Saturday and 16.00 on Sunday. There’s no sailings on Mondays. As far as I can tell this is the timetable throughout the year. The Benchijigua Express leaves Los Cristianos at 19.00 Monday-Friday and 11.30 on Sundays. There’s no departure on Saturdays. From Santa Cruz de La Palma it leaves at 05.30 Tuesday-Saturday and 15.00 on Sunday. There’s no option on Mondays. These times mean that much of the journey will be in darkness for much of the year, only around June and July will there be a chance to get a good view of both La Gomera and La Palma as you sail past. That’s unfortunate as both these islands are impressive if you travel or walk their hills so seeing them from the sea is a bit of treat. 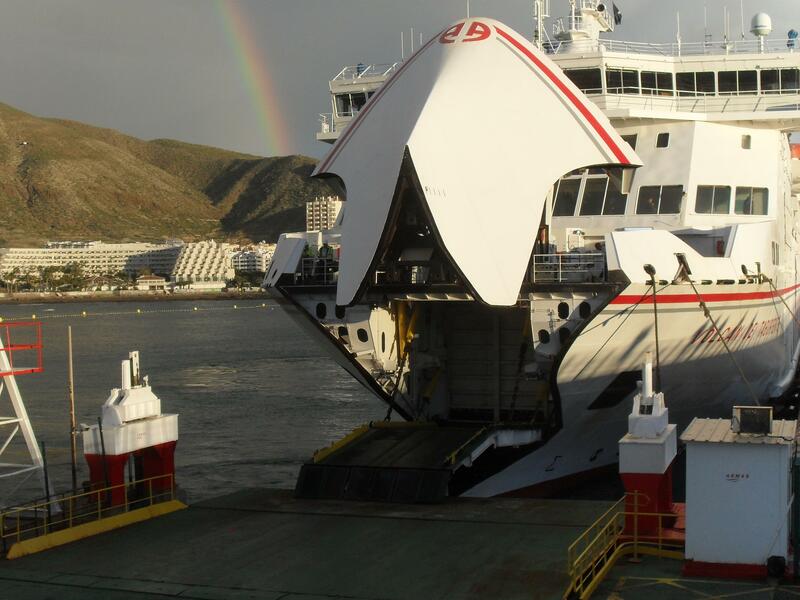 This entry was posted in Canary Islands, Spain, Travel and tagged canary islands, ferry, fred olsen express, la palma, los canarios, los cristianos, naviera armas, santa cruz, tenerife by Michael. Bookmark the permalink.